← Yummy Strawberry & Kale Salad w/ Sesame Balsamic Dressing! These teriyaki bowls with avocado and spicy mayo kind of remind me of caterpillar rolls: the teriyaki sauce is similar to eel sauce, and the creaminess of the avocado and spicy mayo really hits the spot! Tofu has so much water content that it doesn’t absorb marinade very well. What I did was cut the tofu the night before and wrap it in a towel and put it in the fridge over night which dried it out some. Then in the morning I put the tofu in the marinade. I’m doing a lot more planning and cooking ahead these days since there is so little time to play with Ishaan after work! On Sunday we try and figure out what we want to eat during the week and do some prep. Marinate the tofu in a little of the teriyaki sauce (see above for tips). Cook rice (we use a rice cooker and for Calrose it is about 1 cup rice to a little less than 1 1/2 cups water). Heat olive oil in a skillet over high heat and brown the cauliflower. Cover to finish cooking. Add the rest of the teriyaki sauce to heat through. Pan fry the tofu in a little olive oil until browned. 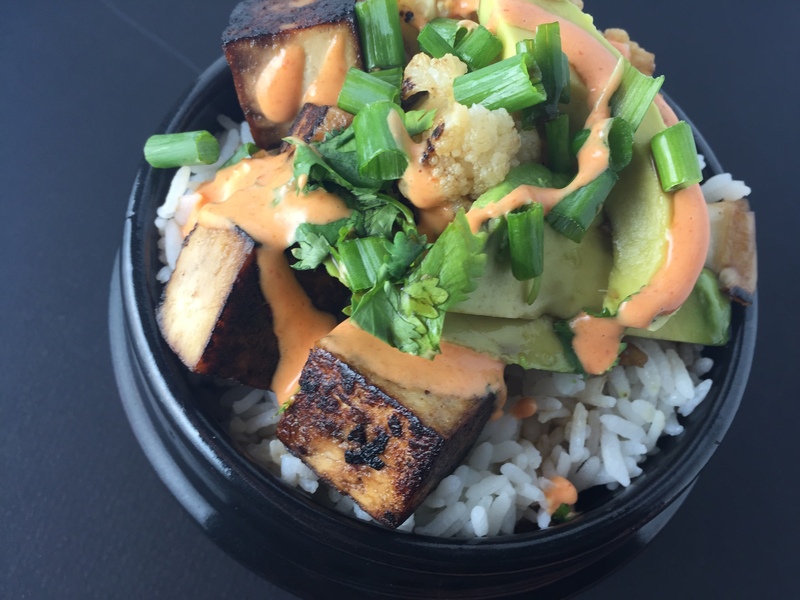 Make up your bowls: rice, tofu, cauliflower, slice some avocado on top, then drizzle with spicy mayo and sprinkle with sesame seeds, green onions, and cilantro!